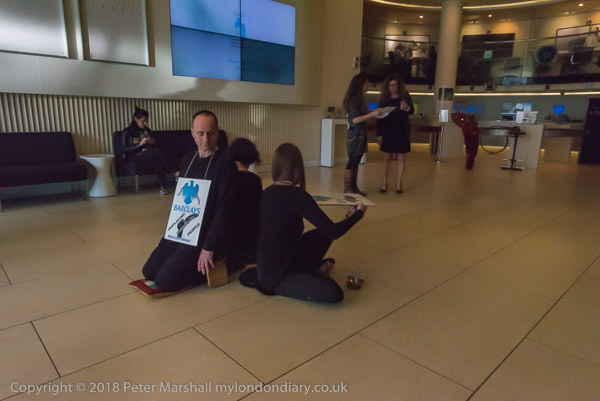 I had little idea what to expect when I turned up in Golden Square in Soho to meet DANCE, the Dharma Action Network for Climate Engagement. 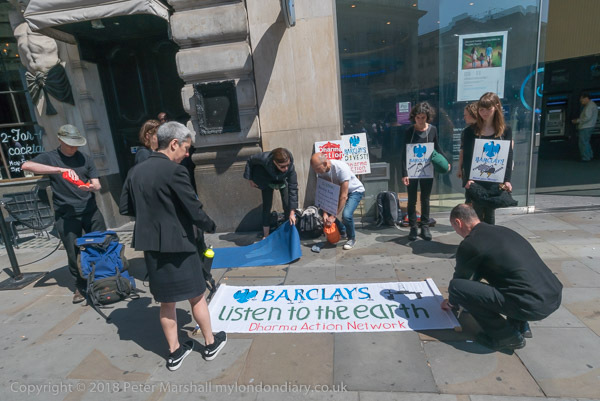 And I was a little disappointed at first to find there were only nine people taking part in this action against Barclays, where they hold a monthly protest. 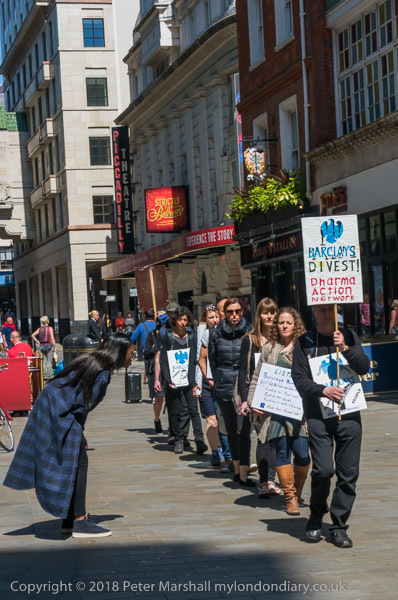 But even nine people walking in a silent row with placards and posters create quite a stir in the streets of Soho. 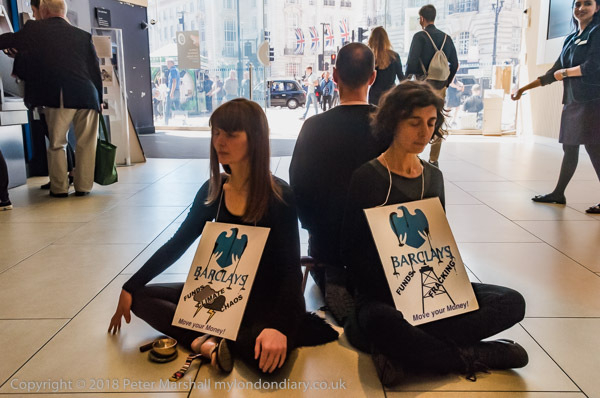 Their aim was to challenge the huge amounts – $12billion in the last 3 years – made by Barclays into into coal, oil and gas exploration which will lead to global warming, melting ice caps, bleaching coral reefs, causing forest fires and more intense storms. 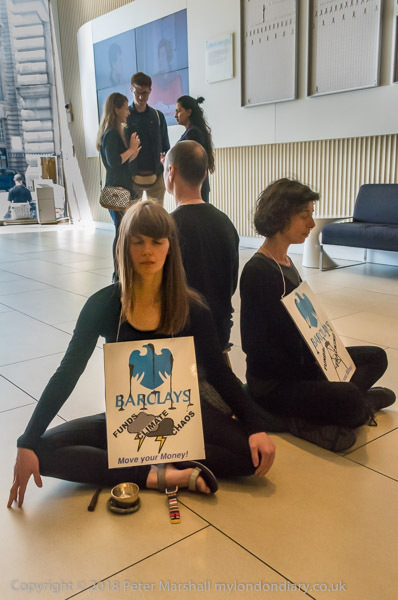 As well as climate change, these investments cause human rights abuses in Columbian coal mining and elsewhere, and DANCE urge Barclays to invest instead in renewable energy. 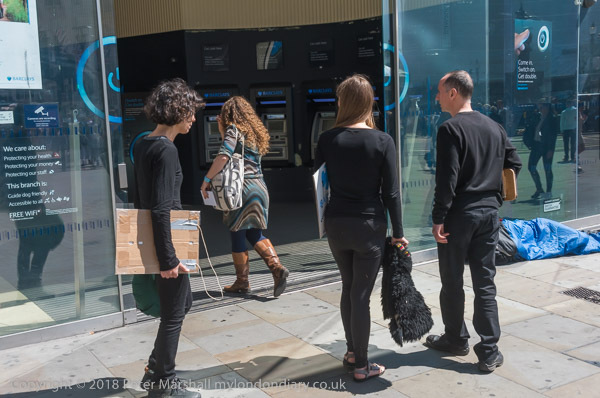 While I watched some of the group settling down to sit in silence on the pavement outside the Poccadilly Circus branch of Barclays, I was rather taken by surprise when four of them walked into the branch. But of course I followed them. Once inside, three of them sat down in the middle of the large expanse of floor space, while the fourth went to explain to the bank staff standing around what they were doing and why. I hadn’t been prepared for this, and I wasn’t thinking at my photographic best, and didn’t really make the most appropriate adjustments to my camera settings. So though I took quite a few pictures, many were not very usable. I was worried that I would be asked to stop taking pictures and didn’t really stop to think, rather hoping that my camera would take care of the technicalities, as it usually does. I’m not quite sure why it got it so wrong with the D750. I was working with auto-ISO, and while that works well so long as you have sensible manual settings, on this occasion shutter speed and aperture were way out, the speed too fast and the aperture too small, and even at high ISO some pictures were grossly underexposed. Those dials by the top of the camera in front of and behind the shutter release are just far too easy to push around by accident, and by the time I realised my mistake it was far too late – and I’d discovered some lens apertures smaller than I knew existed on the 18-35mm lens. I’m not quite sure if I joined the f64 group, but it got pretty close, and on small formats like ‘full-frame’ that isn’t good news. The lighting inside the bank is not particularly low, but it is considerably less than that outdoors on a bright sunny day as this was. So where the large window across the whole front of the bank more or less filled the frame, auto-exposure ensured that the figures in the foreground were more or less in silhouette, which was not at all what I wanted. I needed either to move and take the pictures at a different angle to avoid the window, or to let it overexpose and make the picture at more or less the right exposure for the protesters. Fortunately I did rather better with the D810, where the aperture was only f8 and the images were far more sensibly exposed. So although I’d messed things up a bit I still had the pictures I needed. Even with that large window I’d dialled in -0.7 stops of compensation and the results – with considerable burning and dodging – were usable. After taking some pictures I walked outside the bank and covered the protest from the pavement using the 28-200mm for the people inside. Probably I could have got away with using 1/125 rather than the 1/500th, but the results at high ISO are so good that it wasn’t necessary to risk any subject movement or camera shake. Though I’ve now decided to set the upper limit on auto-ISO to 6400 as above this the loss of quality can sometimes become too noticeable, and I’d like to only use higher settings when I’ve made a conscious decision to do so. On the D810 you can lock both aperture and shutter speed, and I have put this setting onto the personal area of the camera menu. I often keep the aperture locked at f8 as a good general setting, but it is fairly fast and easy to unlock it when I decide I want greater depth of field. Switching the shutter speed to the front dial makes it less prone to fiddling fingers and thumb, and you can in any case hear the difference if you select an unduly slow shutter speed. Apertures work silently. The D750 is more of a problem as I can see no way to lock either aperture or shutter, and those dials seem to move almost when you look at them. You can reverse the rotation of the dials, which is worth trying, as working at full aperture is generally less of a problem with the wide-angle 18-35mm I usually have on the camera, though it can easily lead to over-exposure. I find it useful to set the rear display to give flashing RGB highlights or to show histograms so this becomes very noticeable if you chimp. I need not to let myself get carried away and to be far more aware of the camera settings – which are there in the viewfinder, even if not immediately visible on the camera body as in the old days. Digital controls are far easier to get wrong than those rings and knobs we set on the old film cameras, which were generally pretty hard to change accidentally, and often using ‘P’ setting has made me far less aware of the settings in use. Usually automation works, but sometimes it breeds bad habits. This entry was posted on Thursday, August 23rd, 2018 at 09:06 am and is filed under My Own Work, Photo Issues, Technical. You can follow any responses to this entry through the RSS 2.0 feed. You can leave a response, or trackback from your own site.